Comments: The Basildon district boundary. Comments: High Road, Langdon Hills. Grove Avenue can just be seen on the right. Comments: Vowler Road can be seen on the left. Comments: High Road seen in 1975. The new Langdon Hills housing estate had just been built at the station end. A roundabout can now be seen at the foot of the hill. The High Road begins in Langdon Hills at the summit of Crown Hill, 384 feet above sea level. As you enter the Basildon District from a southernly direction, the road is flat, having just completed a steep ascent up South Hill from the direction of Horndon-on-the-Hill to the Thurrock District boundary. High Road approaching the Crown Hotel in the early 1900s. There are many prominent features at the summit, and these include a church, former school, public house, water tower and a communications tower. The commanding views of the Thames Valley, as seen from Westley Heights and Coombe Wood, are some of the finest in Essex. As the road passes the public house it begins the first descent to a point just beyond the original junction with Lee Chapel Lane (now closed off). To the right of this descent, and adjacent to the pub, once stood a familiar red 'K type' telephone kiosk. This was later moved to the end of Lee Chapel Lane. A former feature of the hill here - now long demolished - was a thatched Post Office which stood on the right about half way up the final ascent. Redevelopment of the road here in the early 1960s resulted in the hill being reduced from a 1 in 7 gradient and the creation of a duel carriageway to the summit. Around the same time Staneway was constructed linking the High Road with Laindon Link. In its creation Staneway dissected Victoria Avenue and Woodgrange Avenue, before curving to join the High Road, with the main Laindon direction section of the High Road reduced to a turn off. The road levels out here briefly, before another small descent, where it again gently slopes beyond Grove Avenue for the final descent, finishing at a point in line with the former Langdon Hills primary school. The distance covered to this point is about 1 mile. In the late 1970s this part of the High Road was bypassed with a new road, the High Road then being closed off at a point adjacent with the newly built Triangle Shopping Centre, with vehicular access now from the bypass or via Berry Lane. Shops at Nightingale Parade on the corner of Milton Avenue. Valence Way entrance/exit would later be built here. From here on the road is flat and residential. In 1974 the Samuel Road junction with the High Road was closed to vehicular access, and later in 1983 the Alexander Road junction was also closed off. Until the early 1970s a variety of shops fronted the High Road here. One such parade was called Nightingale, another Bolsover Terrace, as well as a dentist, doctor's surgery and a telephone exchange. From around 1972 onwards Basildon Development Corporation began constructing a large housing estate which now borders the High Road on one side from Valence Way where it exits at the roundabout at the foot of the incline leading up to the railway station, continuing on to the former school, and beyond and bordering the new left curve alignment to Delmores. All shops and properties on this side, with the exception of the school, were demolished over a number of years prior to work starting. Shops on the opposite side to the new estate were also demolished, and Peperell's newsagents was briefly resited in a temporary building between Emanuel and Vowler Road while the Triangle shops were being constructed. Shops between Emanuel and Vowler Road. When the Triangle shops opened in 1976 it was dismantled and private housing now borders the High Road. 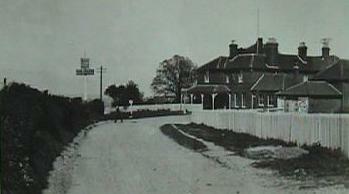 Beyond Vowler Road stood the original Elim Pentecostal church, which faced the High Road until being rebuilt in Vowler Road. The final section leading to the Laindon Station now has a roundabout before a small incline takes the road over the railway and into Laindon. For many years the High Road was part of route B1007, which began at the old A13 close to Stanford-le-Hope, running through Horndon-on-the-Hill before reaching Langdon Hills. 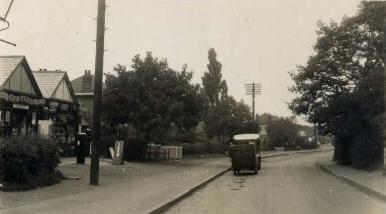 The route continued through High Road, Laindon crossing the Fortune-of-War roundabout (previously a crossroads) and joining up with Noak Hill Road at the junction with the old Fortune-of-War public house. Some years ago Staneway (originally B1036) was given this designation, and the route is lost to the A176 before once again becoming the B1007 beyond Billericay and through to Chelmsford. The name High Road probably dates back to the 1890s but was also known as Station Road (possibly from the station to the Berry Lane junction) in the early 1900s following the arrival of the railway. 1) The Samuel Road junction with High Road was closed to vehicular movements from 11th November, 1974. The District Council first gave notice of this in December 1973 indicating that there may have been written objections to the proposed closure. The District Council of Basildon (Samuel Road, Langdon Hills) (Prohibition of Driving) Order 1974. 2) The Alexander Road junction with High Road was closed to vehicular movements from 28th November, 1983. The District of Basildon (Alexander Road at junction with High Road, Langdon Hills) (Prohibition of Driving) Order 1983. 3) From 3rd June 1974 entry to Berry Lane from the High Road (B.1007) junction was prohibited to vehicular movements. District of Basildon (Berry Lane) (Prohibition of Entry) Order 1974. Text researched and written by William Cox 2002 with revisions 2007. Copyright © 2002, 2007, B. Cox - Basildon History Online. All rights reserved.